For the film based on the book, see Moneyball (film). For the statistical approach sometimes referred to as "Moneyball", see Sabermetrics. Moneyball: The Art of Winning an Unfair Game is a book by Michael Lewis, published in 2003, about the Oakland Athletics baseball team and its general manager Billy Beane. Its focus is the team's analytical, evidence-based, sabermetric approach to assembling a competitive baseball team despite Oakland's small budget. A film based on the book, starring Brad Pitt and Jonah Hill, was released in 2011. The central premise of Moneyball is that the collective wisdom of baseball insiders (including players, managers, coaches, scouts, and the front office) over the past century is subjective and often flawed. Statistics such as stolen bases, runs batted in, and batting average, typically used to gauge players, are relics of a 19th-century view of the game and the statistics available at that time. Before sabermetrics was introduced to baseball, teams were dependent on the skills of their scouts to find and evaluate players. Scouts are experienced in the sport, usually having been players or coaches. The book argues that the Oakland A's' front office took advantage of more analytical gauges of player performance to field a team that could better compete against richer competitors in Major League Baseball (MLB). 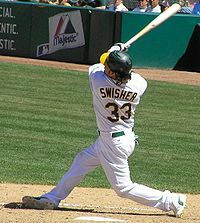 Rigorous statistical analysis had demonstrated that on-base percentage and slugging percentage are better indicators of offensive success, and the A's became convinced that these qualities were cheaper to obtain on the open market than more historically valued qualities such as speed and contact. These observations often flew in the face of conventional baseball wisdom and the beliefs of many baseball scouts and executives. By re-evaluating their strategy in this way, the 2002 Athletics, with approximately $44 million in salary, were competitive with larger market teams such as the New York Yankees, who spent over $125 million in payroll that season. Because of its smaller budget, Oakland had to find players undervalued by the market, and their system has proven itself thus far. The approach brought the A's to the playoffs in 2002 and 2003. Lewis explored several themes in the book, such as insiders vs. outsiders (established traditionalists vs. upstart proponents of sabermetrics), the democratization of information causing a flattening of hierarchies, and "the ruthless drive for efficiency that capitalism demands". The book also touches on Oakland's underlying economic need to stay ahead of the curve; as other teams begin mirroring Beane's strategies to evaluate offensive talent, diminishing the Athletics' advantage, Oakland begins looking for other undervalued baseball skills, such as defensive capabilities. The Oakland Athletics had the third-lowest team payroll in the league (about $40 million) marginally higher than that of the Montreal Expos, whose franchise was transferred to the Washington Nationals in 2005. Moneyball also touches on the A's' methods of prospect selection. Sabermetricians argue that a college baseball player's chance of MLB success is much higher than a traditional high school draft pick. Beane maintains that high draft picks spent on high school prospects, regardless of talent or physical potential as evaluated by traditional scouting, are riskier than those spent on more polished college players. Lewis cites A's minor leaguer Jeremy Bonderman, drafted out of high school in 2001 over Beane's objections, as an example of the type of draft pick Beane would avoid. Bonderman had all of the traditional "tools" that scouts look for, but thousands of such players have been signed by MLB organizations out of high school over the years and failed to develop. Lewis explores the A's approach to the 2002 MLB draft, when the team had a run of early picks. The book documents Beane's often tense discussions with his scouting staff (who favored traditional subjective evaluation of potential rather than objective sabermetrics) in preparation for the draft to the actual draft, which defied all expectations and was considered at the time a wildly successful (if unorthodox) effort by Beane. Moneyball traces the history of the sabermetric movement back to such people as Bill James (now a member of the Boston Red Sox front office) and Craig R. Wright. Lewis explores how James's seminal Baseball Abstract, published annually from the late 1970s through the late 1980s, influenced many of the young, up-and-coming baseball minds that are now joining the ranks of baseball management. Moneyball has entered baseball's lexicon; teams that value sabermetrics are often said to be playing "Moneyball." Baseball traditionalists, in particular some scouts and media members, decry the sabermetric revolution and have disparaged Moneyball for emphasizing sabermetrics over more traditional methods of player evaluation. Nevertheless, Moneyball changed the way many major league front offices do business. In its wake, teams such as the New York Mets, New York Yankees, San Diego Padres, St. Louis Cardinals, Boston Red Sox, Washington Nationals, Arizona Diamondbacks, Cleveland Indians, and the Toronto Blue Jays have hired full-time sabermetric analysts. When the Mets hired Sandy Alderson – Beane's predecessor and mentor with the A's – as their general manager after the 2010 season, and hired Beane's former associates Paul DePodesta and J.P. Ricciardi to the front office, the team was jokingly referred to as the "Moneyball Mets". Like the Oakland A's in the 1990s, the Mets have been directed by their ownership to slash payroll. Under Alderson's tenure, the team payroll dropped below $100 million per year from 2012 to 2014, and the Mets reached the 2015 World Series (defeating MLB's highest-payroll team, the Los Angeles Dodgers, en route). Lewis has acknowledged that the book's success may have hurt the Athletics' fortunes as other teams accepted sabermetrics, reducing Oakland's edge. Daryl Morey's own unorthodox approaches in the NBA have been called "Moreyball". Since the book's publication and success, Lewis has discussed plans for a sequel to Moneyball called Underdogs, revisiting the players and their relative success several years into their careers, although only four players from the 2002 draft played much at the Major League level. 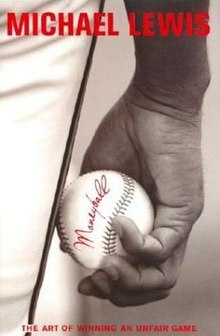 Moneyball also covers the lives and careers of several baseball personalities. The central one is Billy Beane, whose failed playing career is contrasted with wildly optimistic predictions by scouts. Nick Swisher, the prospect the traditional scouts and statisticians agreed upon. Kevin Youkilis – referred to in the book as the "Greek God of Walks". Youkilis was drafted in 2001 by the Boston Red Sox and heavily desired by Beane, who tried to snare him via a failed three-team trade discussed in the book. Prince Fielder – son of former slugger Cecil Fielder, drafted in 2002 year by the Milwaukee Brewers. Claimed by Beane to be "too fat" even for the A's. B. J. Upton, now known by his birth name of Melvin Upton, Jr. – cited as an example of "bad high school" draft pick. Scott Kazmir – cited as an example of teams' – in this case the New York Mets – foolishness in drafting high school pitchers because of the difficulty in projecting their future, as opposed to college players. Ray Durham – traded to the Oakland A's in the middle of 2002, cited as a potent base-stealer and "rent-a-player": an impending free agent who would likely attract large offers from other clubs with larger available payrolls than Oakland's while leaving Oakland with draft picks in the next year's draft, a rule since abolished with the 2011 Major League Baseball Collective Bargaining Agreement. Durham would eventually sign with the San Francisco Giants. Alex Rodriguez – Beane compares A-Rod's stats to those of Eric Chavez. Beane assembled a list of twenty players they would draft in a "perfect world"; meaning if money was no object and they didn't have to compete with the other twenty-nine teams. #26 – John McCurdy – never made MLB. Last played minor league ball in 2006. #30 – Ben Fritz – never made MLB. Last played minor league ball in 2010. #35 – Jeremy Brown – MLB experience consists of 11 plate appearances for Oakland in 2006. Last played minor league ball in 2007. #37 – Stephen Obenchain – never made MLB. Last played minor league ball in 2006. #39 – Mark Teahen – spent parts of eight seasons in MLB, played only in the minors in 2012 and 2013. #67 – Steve Stanley – never made MLB. Last played minor league ball in 2006. #98 – Bill Murphy – MLB debut in 2007, pitched approximately 18 innings in MLB. Has played only in foreign and minor leagues since 2009. #128 – John Baker – traded to the Florida Marlins and has played around 300 total games in six MLB seasons. #158 – Mark Kiger – MLB experience consists of 1⅔ innings at second base for Oakland in the 2006 American League Championship Series. Never played in the MLB regular season. Last played minor league ball in 2009. #188 – Brian Stavisky – never made MLB. Last played minor league ball in 2010. #218 – Brant Colamarino – never made MLB. Last played minor league ball in 2007. Richard H. Thaler of the University of Chicago Graduate School of Business and Cass R. Sunstein of the University of Chicago Law School described the book as a "sensation... Lewis has a wonderful story to tell, and he tells it wonderfully... Lewis also raises some serious puzzles that he does not resolve, and his account has some large and perhaps profound implications that he does not much explore." A movie based on the book was released in 2011. Actor Brad Pitt stars as Billy Beane, while Jonah Hill plays a fictional character based on Paul DePodesta; Philip Seymour Hoffman plays A's manager Art Howe. Academy Award-winning screenwriter Steve Zaillian was hired to write the script, and Steven Soderbergh was slated to direct, replacing David Frankel. But in June 2009, because of conflicts over a revised script by Soderbergh, Sony put the movie on hold just days before it was scheduled to begin shooting. Soderbergh was eventually let go. Bennett Miller took over directing duties, and Aaron Sorkin rewrote the script. Shooting began in July 2010 at Blair Field, the Sports Stadium for Wilson High School (Long Beach, California), Sony Studios in Culver City, Dodger Stadium, and the Oakland-Alameda Coliseum. The film was released in theaters on September 23, 2011. Moneyball was nominated for six Academy Awards, including Best Actor and Best Picture. The book is parodied in the Simpsons episode "MoneyBART", in which Lisa manages Bart's Little League baseball team using sabermetric principles. Bill James made an appearance in this episode. ^ "A Study of Sabermetrics in Major League Baseball: The Impact of Moneyball on Free Agent Salaries" (PDF). ^ Woolner, Keith (2007-05-04). "Articles | Aim For The Head: Aim For the Front Office". Baseball Prospectus. Retrieved 2011-09-24. ^ "The Moneyball Mets". New York. 25 March 2011. Retrieved 2011-04-06. ^ "Michael Lewis on A's 'Moneyball' legacy". San Francisco Chronicle. 18 September 2011. Retrieved 2011-09-23. ^ "Who's On First". New Republic. 2003-09-01. Retrieved 2017-02-09. ^ "More Moneyball, Same Problems". Slate. 2011-09-21. Retrieved 2017-05-22. ^ "Baseball's Big Three: A Look Back at Tim Hudson, Mark Mulder, and Barry Zito in Oakland". Grantland. 2015-09-23. Retrieved 2017-05-22. ^ Siegel, Tatiana. "Columbia pitches Moneyball to Pitt", Variety (October 16, 2008). ^ ""Benched: 'Moneyball' Flick on Hold at Last Minute", Associated Press (June 22, 2009)". Sports.espn.go.com. 2009-06-22. Retrieved 2011-09-24. ^ a b Fleming, Mike. ""Finally, It's Batter Up For 'Moneyball,'" Deadline.com (April 12, 2010)". Deadline.com. Retrieved 2011-09-24. ^ ""'Moneyball' begins filming in Oakland", ABC7 KGO-TV San Francisco, California (July 27, 2010)". Abclocal.go.com. 2010-07-27. Retrieved 2011-09-24. ^ "'Moneyball' films scenes in Dodger Stadium". Los Angeles Times. 2010-09-14. Retrieved 2011-09-24. Roberts, Russ (January 29, 2007). "Michael Lewis on the Hidden Economics of Baseball and Football". EconTalk. Library of Economics and Liberty.